THIS BOOK IS SO WEIRD!!! Seriously. Like, I have no other words to describe it than weird. So weird. So very weird. This book is kind of sci-fi, kind of mystery, kind of dystopian... it's a lot of things mashed together and it works. None of its characters get names -- just titles. You spend the entire book having no idea what the heck is going on. Things are only slightly more clear by the end. But only slightly. 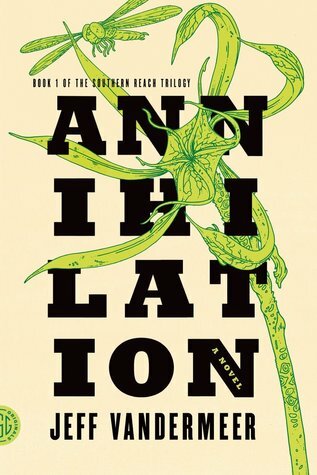 VanderMeer excels at writing things that are weird and that kind of make you shudder. You'll think twice before brushing against a wall in the dark after reading this one. It's not scary -- at least, it wasn't to me -- but it's definitely unsettling. This is a story of biology and evolution run amok, with maybe some hints of the otherworldly. Annihilation is the kind of book I want to take my time with. The way that he writes is lyrical and packed with detail, so I didn't want to rush. As the story goes on, we learn more and more about the biologist and what makes her not precisely a reliable narrator. As she opened up more about herself, there was a lot there that I could identify with - she became more human as the story goes on, which, well, once you've read the book, I want you to come back here and talk with me about that, alright? As an aside: how awesome is it that there is only one man who actually plays a role in this story? I'm not going to give away who he is, but, yeah, one dude. Our other characters are all scientists who are women, and it makes me happy. I am really looking forward to reading the other two books in this series and hopefully unlocking some more answers about Area X. This book -- with its weirdness and its lack of answers and its sometimes uneven pace -- isn't for everyone. But if you're into things that are just sort of undefinably weird, this book should be right up your alley.